This video is part of the appearance, “Interview with Steve Woo“. 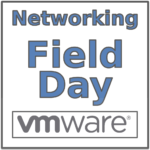 It was recorded as part of Networking Field Day Exclusive with VMware at 15:30 - 15:35 on May 1, 2018. Tom Hollingsworth interviews Steve Woo, Sr. Director, Product Management, Networking and Security, discussing announcements from Dell Technologies World about NSX SD-WAN by VeloCloud.